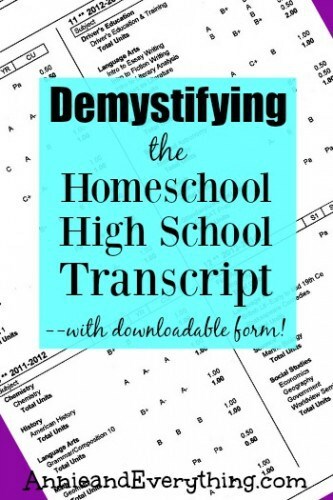 Home » College Prep » Demystifying the Homeschool High School Transcript — with Fillable PDF!! I asked my Facebook group recently to share their greatest fear about homeschooling high school. (BTW, the group is called It’s Not that Hard to Homeschool High School. Join today by clicking HERE; you won’t regret it! 🙂 ) For many it was transcripts. They are worried about making them correctly, so that colleges will accept them. There seems to be some kind of power in the piece of paper from the public school, and many moms think they can’t produce that same magic in their homeschool high school transcript. Just to be sure I wouldn’t be steering you wrong, I did search for an authoritative list of all the information that is absolutely REQUIRED on a high school transcript. And — no surprise — I found varying recommendations. Which confirms for me that the only absolute necessities are what I already listed above. All other information, such as standardized test scores, extra-curricular activities, etc. is OPTIONAL. Much of that type of information will be found on the application itself, so there is no need to replicate it on the transcript. I do recommend giving your child’s date of birth and social security number, just so that the colleges can easily compile their paperwork. You will also want your school name and address at the top. 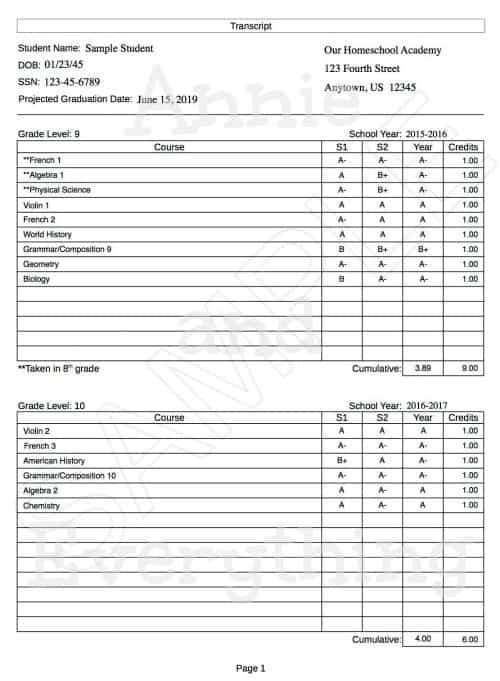 I didn’t include a grading scale on my daughters’ transcripts, because I gave that information separately along with course descriptions. (They are a topic for another post… watch this space… 🙂 ) But if you want to include a grading scale, you certainly may. Honestly, though, a transcript is a very simple document. There is no need to be scared!! If you are concerned about a particular college application, then look on their website under “Admissions” to see if they have any specific requirements for transcripts. Chances are they do not, because they know they can’t expect public schools to adapt their transcripts for individual student applications. Often a college will have a page on their website just for homeschool applicants, and there they will tell you what they need to see. But I would be surprised if it differs at all from what I’ve already described. Oh, and that whole “official transcript” vs. “unofficial transcript” thing?? Don’t even worry about it. I suppose there are some colleges that may want you to have the transcript notarized to make it “official.” But there is no need to do that unless they specifically ask for it. Why spend the money? I never had any of my girls’ transcripts notarized, and none of the many colleges they applied to had a beef about it. Below is what my three older girls’ transcripts all looked like. This was formatted by the homeschool record-keeping software I was using at the time, called Homeschool Tracker. 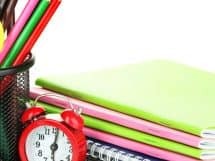 To be honest, using your homeschool software is really the easiest way to go, because the software does all the calculations and formatting, and you just choose which student, courses, and other information you want on there and then print that bugger out. One small detail: Use “Projected Graduation Date” for the transcript you send with college applications; after your child has indeed graduated, use “Graduation Date.” I forgot that here… um. But what if you are not using homeschool software, or you don’t like the way the pre-formatted transcript looks, and/or you don’t want to take the time to format your own form? Yes, I am here to make things easy!! That’s what this blog is all about!! So I have created a fillable PDF transcript form that you can download, type your child’s information into, and print. All the calculations of grades and GPA will be up to you (instructions included); but the formatting is all done, which is half the battle! Since it is a PDF, you can use it on either a Mac or PC. It is available for $4.99, which makes it a very reasonable way to have a great-looking transcript! To sum up, the homeschool high school transcript is very doable, y’all, just like every other aspect of homeschooling high school. Don’t make it more difficult or worrisome than it needs to be. You’ve got this!! This is great Annie! pinned so I can look at it closer later 🙂 Thanks! Great article. I find that in my work with parents, creating the homeschool transcript is the number one concern after: “What about a diploma?” I would also add that it is important to create course descriptions in addition to the transcript. For my daughter, I actually attached these descriptions to the transcript in a PDF form. This included a brief description, instructor (or independent), and assessment method. This gives the college admissions more info, especially for non-traditional courses. Yep, that’s true, Evelyn. I’m gonna hit those in another post! 🙂 Thanks for stopping by! Evelyn, I totally agree with you. Often course descriptions are not needed, but when they are, they are essential to admission. Great post, Ann! I would add, in our experience, the schools wanted test scores on the transcript. Having the information on one page at their fingertips saved them time. Saving busy admissions personnel time is a win-win for everyone. One of those points we found varies per university. But, again, this is a wonderfully helpful post. Thanks for posting and pouring into families lives! Thanks for the comment, Cheryl! My own experience has been that schools aren’t interested in my reporting the scores as much as they are in receiving the official scores from the testing agencies themselves. That’s why I did not include a place for them on my form. Certainly one can add them to another place in the application packet. Do public schools put test scores on their transcripts? I doubt it, because they have no way of knowing individual student scores. How awesome! Thank you for the printable! Very nice. Thank you! Now, where do I find the free printable transcript PDF? Thank you so much for sharing this post with us on the Hip Homeschool Hop!! So many moms are afraid to homeschool high school because of having to create a transcript and not knowing how to handle this sort of thing. I appreciate your sharing this information with our readers! Thanks! Very helpful. Encouraging you to go ahead and write the post for creating a course description. Didn’t see a link. I’ll be watching for it. Thanks for the form! I am so glad I found your website on Pinterest! This is making me feel so much better. I do have one question. I saw where some one said that you need to buy an embosser, with your school name on it, and you then embossed it on your HighSchool Transcript? Is this true? Awwww.. I feel better. Thanks. Now I won’t waste my money on one! Hi I purchased the fill able transcript, but it won’t let me fill? Trying to edit but there is a security lock on the document that states I “cannot edit or copy this document.” do I need a passcode? 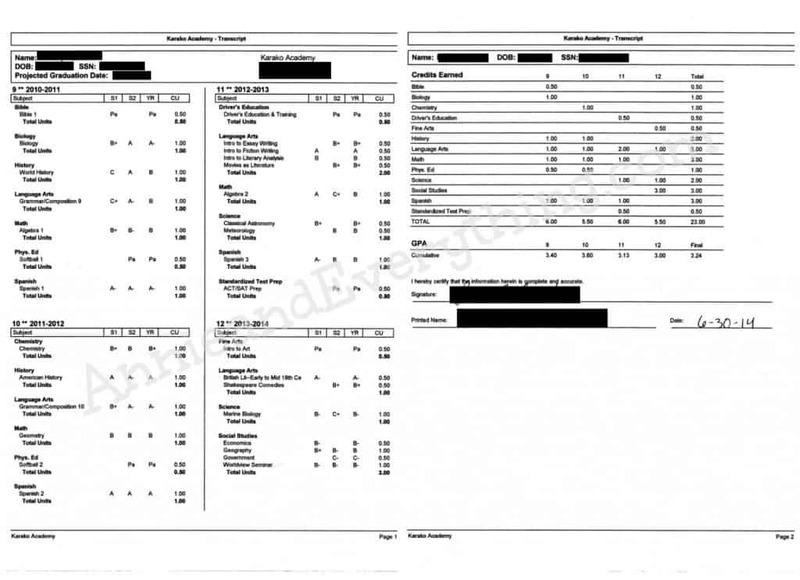 I have homeschooled 2 children and created a very professional High School Transcripts (which was the easiest part!). Our challenge has been finding a notary who will notorize an unofficial transcript that I have generated on my own. Every college we have aplied to, including community colleges, required our transcripts to be notorized. Is there a company I can pay to generate an “official” transcript? Anything a parent generates on their own has not been excepted in our experience. I understand each state has different requirement and we reside in Texas. I have NEVER had to notarize a transcript, and I have NEVER had our transcript not accepted by colleges. Are you in my high school Facebook group? There are many families from TX in there, and maybe they can help you with this. I have to think that maybe you are misunderstanding somewhere along the line. But even if you are correct, I’m also not sure why a notary wouldn’t notarize your signature — they are not claiming anything about the transcript by doing so, they are just witnessing your signature. I don’t think they have any risk. When I do need something notarized, I go to my bank where they know me, and because they know me, they trust that what I’m asking them to sign is legit, lol. I’ve never had to notarize transcripts. My oldest is at Texas A&M, between 2 homeschool graduates, they applied to quote a few Texas universities, and we never had to have anything notarized. If they have finished school, you just need to change it to say Official Transcript. My son applied to several colleges in 4 different states and didn’t need any of the transcripts notarized. When he completed his schooling, I changed the wording to Official Transcript, signed and dated it. I put it an envelope and sealed it. They all accepted his transcript. Hello, I really want to purchase your transcript PDF but we do not have a paypal account. I often use paypal just using my debit card number. Is there a way to do that instead of having a link to pay sent to a paypal email account? Thank you so much for this! My oldest son graduates HS in a couple of months and I was scrambling thinking I had to include every single detail in his transcript in order for it to be acceptable. You have definitely quelled my fears and saved me a ton of time!